In fact, 53 British Columbians drown every year, while another 41 “near-misses” on the water result in acute hospitalization. The vast majority (almost 90%) of these incidents happen because the victims weren’t wearing a lifejacket or personal flotation device (PFD). And that’s why we returned once again to Vancouver’s beloved giant-sized sculpture “A-maze-ing Laughter,” dressing the oversized bronze figures with oversized orange lifejackets. Our goal: to encourage people to think about staying safe before they make a splash. 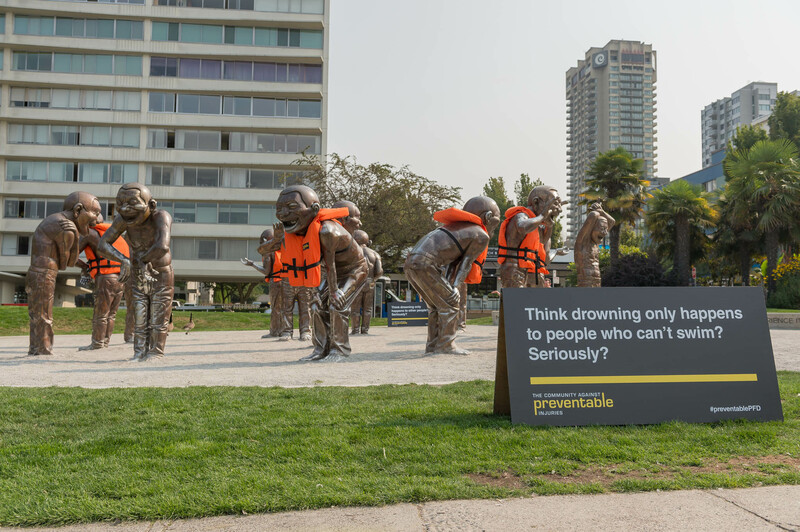 Located at the entrance to English Bay at the corner of Denman and Davie Streets, our installation serves as a reminder that the vast majority of “accidents” on the water aren’t accidents at all. They’re the direct result of choices we make—or, more accurately, choices we don’t make. No matter how much fun we’re having on the water, a lifejacket or PFD isn’t optional equipment. It is, quite literally, a lifesaver. Throughout our history, we’ve worked hard to challenge the belief that safety and fun are mutually exclusive—that wearing safety gear isn’t “cool,” and just gets in the way of a good time. We know that there’s a direct link between this attitude and a good many of the preventable injuries that happen in BC, whether they happen on the water, on the ski hill, at the skate park, on the bike trail, or elsewhere. It’s kind of funny to see a bunch of larger-than-life, laughing statues dressed up in lifejackets. It catches your eye. It sticks in your mind. It’s hard to ignore, and even harder to forget. Hopefully, that’s exactly the same thing that happens the next time you think about wearing a lifejacket.